The sneaker maker on Thursday said it has created a limited-edition shoe based on a glowing pair that appeared in the popular 1989 movie “Back to the Future II.” The 2011 Nike Mag is designed to be an exact replica of the fictional sneaker, including a glowing Nike name on the strap. But unlike the movie version, these shoes won’t lace themselves. 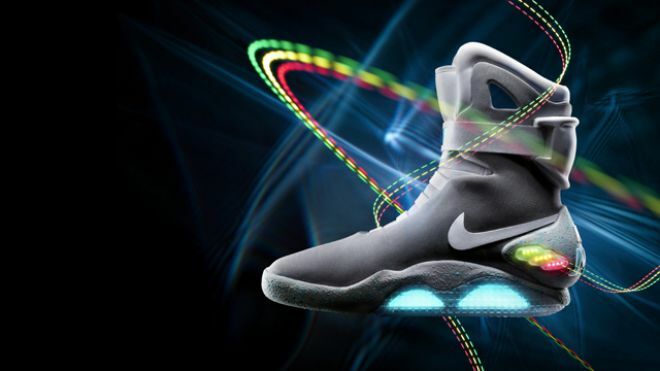 Nike will release 1,500 pairs of the 2011 Nike Mag sneaker for auction on eBay and donate all proceeds to the Michael J. Fox Foundation for Parkinson’s disease research. Fox famously played Marty McFly in the “Back to the Future” time-travel trilogy, where he wore the shoes during a visit to the year 2015. Limited-edition shoes can draw as much, if not more mania, as a new movie or comic book release. Fans obsessively track the latest news and are willing to camp out all night or spending hundreds or more for a single pair online. Nike’s collector sneaker has been long awaited by shoe collectors and movie fans, who have been urging the company to make them ever since the movie was released. There were roughly eight or ten pairs used in the movie, some of which are in Nike’s possession and a few that collectors somehow got their hands on. Owning them, or even seeing a pair of them, has become a singular pursuit for some fans. There was even an online campaign a few years ago called “McFly 2015, Make it Happen” that gathered thousands of signatures to convince Nike to bring the McFly shoe back. Nike Inc., based in Beaverton, Ore., decided more than four years ago to create the shoe, but was unsure when a pair would be ready. Unlike the shoes in the movie, the real-life versions had to be designed for day-to-day use. For instance, the design used in the movie required Fox to wear a battery pack with wires running down his pants to light the shoe, which was the best technology available at the time. Hatfield said the Nike Mag has been difficult to develop and the electrical systems, which illuminate the shoe for up to five hours, have been one of the most challenging things the company has ever done in footwear. But the timing seemed perfect to bring the shoe back to support a bigger idea. That Nike is releasing the shoe in 2011 enables it to take advantage of a matching grant for the foundation. Google founder Sergey Brin and his wife Anne Wojcicki have offered to match all donations to the Michael J. Fox Foundation up to $50 million through the end of 2012. Nike also has created a faux “lost scene” from the film to promote the shoe that includes original cast members Christopher Lloyd and Donald Fullilove, who will be joined by basketball star Kevin Durant and renowned Nike designer Tinker Hatfield. The auction begins Thursday and will end Sept. 18.